THE STAGE IS SET FOR WEIRD AND WONDERFUL WINS! You may just have a win! Mr. Green Casino :: Rabbit in the Hat online slot – PLAY NOW! Roll up, Ladies and Gentlemen, roll up for some serious magic with Rabbit in the Hat! 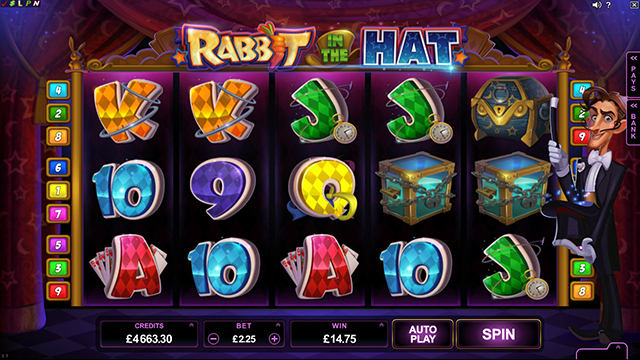 Rabbit in the Hat is no illusion – with a minimum bet of only 0.09, each spin holds the potential to transform Reels into riches. Watch in amazement as a Base Game springs to life, featuring 5 x 3 Reels, and 9 lines on which to win. On each sparkling spin, a colourful Magic Hat may appear at random above Reel 5 with a wave of the magician’s wand. During each subsequent spin, the Hat will bounce one Reel to the left. If a Hat reaches the far left Reel without being awarded, it will hop off screen on the next spin. But, if the Reels stop with a Wild on a Hat-topped Reel, that Hat’s prize will be awarded! This game has a whopping 4 different Magic Hats up for grabs! A Wild Hat turns up to 3 Reels wild, a Cash Hat awards a random cash prize, a Free Spins Hat conjures up 10 fantastical Free Spins per Hat, PLUS a marvellous Mystery Hat randomly awards one of the Magic Hat Prizes. Hats appear at random, so with the flick of a wand, you could end up with multiple Hats above your Reels, and multiple wins being awarded! With a brand new take on a Free Spin trigger, all it takes is one Free Spin Hat to land over a Wild! Once Free Spins has been triggered, the stage is set with a Magic Hat atop every single Reel. On each spin, another Hat will be added on top of the 5th Reel, so that every spin holds more oppourtunity of winning big. Land another Free Spin Hat above a Wild during Free Spins, and more Free Spins are yours! With wins of up to 90 000.00, this feature-filled game will have you jumping for joy! Rabbit in the Hat :: You can try this NEW Slot game right now at the following casinos: All Slots Casino, Red Flush Casino, Jackpot City Casino, Casino LaVida, Crazy Vegas Casino, Golden Riviera Casino, ComeOn Casino, Mr.Green Casino, SlotsMillion Casino and Casino-Mate.